I always showed you the Invalides from the other side (what is called l'Esplanade), but last night on the way back from a dinner party at friends who live near this neighborhood, I passed by this magnificent building, which is actually called L'Eglise Saint-Louis des Invalides and which is famous for sheltering the tomb of Napoleon. I never went inside though - yes you heard me, never! Have a quiet Sunday everyone. Can't remember if I've ever even seen this side, but I love this photo!. Bonsoir, mon general (you, not Nappy). This looks like a miniature. Such a wonderful capture and well worth the wait. Of course it's still early in CA. You can peer down and look at Napoleon's tomb and then go see a museum of Army things. A real guy thing. By the way, I HAVE been inside to see his tomb—which is so huge, they could probably fit 50 of him inside. The light in this shot is unbelievable. You must go inside, Eric. It really is amazing. Such a large tomb for so small a man. Ha, ha Alexa - we keep missing each other! from cali -- it's bi-coastal ping-pong! Napoleon was 5 feet 2 inches in French measurments, 5 feet 6 1/2 inches in British measurements. This was an average height for men at that time. Napoleon surrounded himself with tall bodyguards. Le Petit Caporal was a affectionate nickname given by the soldiers of the great Army to their emperor. PHX it might be a guy thing, but nevertheless I went inside to see it. The museum is very interesting, I was amused to see, among other things, Napoleon's uniform. And Napoleon's tomb is a must see! Hey GF Alexa! I forgot about Nappy and Jo - you made me laugh. Monica, I guess you and I are each one of the guys! I loved those museums as well as the monument/church. And, I'm with you from cali, Eric - you really must go inside. There is such grace, splendor and emotion in those rooms. The model map museum is one of a kind. I love the photo, too - you can just see the light glancing redly off the cross at the top. Another screensaver shot! Thanks!! It brings back a memory of walking across the intersection in front of the building just like this, at night, with no one around, when I went to look for a concert that I couldn't find in the neighborhood. It felt very silent and majestic. My first thought was the same as what Cali expressed: that this looks like a miniature. What a beautiful glow you captured, and the information is so interesting. I would love to go inside to experience what the others have described. Wow, and the dome is so gold and sparkly in the enlarged photo. You have a pretty spire on your crown today, Alexa. Hello, I came across this website by chance and am particularly excited by this happy accident. I am sad to be away from this city when the one I love is there. But your lovely pictures remind me of the places I saw myself, and the ones that I have not seen I will put on my list to see when I return. You do a splendid thing by sharing your art. Beautiful. I long to visit Paris one day. I love this photo. I remember seeing it many times when I lived in Paris in the 80's. Love this site! Ooh, so golden. Lovely shot, Eric. Yes, it looks like a miniature to me, too. When I was there the church was closed. I did see the tomb. Other impressive and beautiful tombs surround Nappy's. It's quite a building. Worth a visit, even if you're not a fan of the man himself. Very pretty photo Eric, not much compares to Les Invalides lit up at night except perhaps San Francisco City Hallat night. 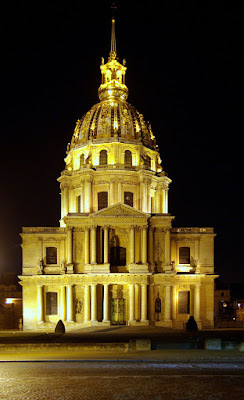 The dome of the building was inspired[copied]from Les Invalides. Lois...BTW stunning new profile shot. Eric, this is a stunning shot. I know you don't drag around a tripod, so are you just really steady? tonton_f - what a remarkable city hall! One year I visited the tomb and the churches. There are two churches: one for the officers, one for the enlisted men. It really is fascinating. Napoleon's tomb is worth a visit, also. What a beautiful photo, it's glowing. I just can't believe you haven't been inside. If you're born and raised in Paris I would think this is a place you at least have been with school as part of history lessons. But apparently NO... or did you skip the lectures that day ? I'd have thought, too, you'd have gone whilst at school. ? This looks a gorgeous Zazzling sight Eric. Beautiful tone for this magnificent building. My favorite part of the inside of Invalides is not the tomb of Napolean, but the little chapel on the side in tribute to Marshall Foch, French commander in World War I. It is a full-sized bronze statue of a casket with 6 bronze soldiers as pall bearers. The room is illuminagted by the light filtering through a deep blue stained glass, which cases a glow on the somber bronze statue. The atmosphere is mystical. My description will not do it justice. Perhaps Eric will show us a photo of it in the future, if he ever gets inside as millions of tourists do on their first visit to Paris. While you are inside, Eric, enjoy the beautiful chapel, and take a glance at the tomb of that Napolean chap. You can't miss it. It's the big marble one in the center of the rotunda. The way you framed this photo, it looks like a replica instead of the real thing. Very nice. You must go inside sometime. It is quite beautiful. Eric - I was just thinking that the color and the sense that this is a miniature remind me of the comments on the photo of the Chateau de Vincennes - which you also took at night. I think there must be something about the night lighting and the yellow cast that makes them seem like miniatures. I attributed it to the proportions of the building last time, but now I don't think so! Any insight into the mystery?? My comment is what happens when you think you are about to become GF and you are desperately trying to type 2 full lines pertaining to the picture. Who thought up that rule, anyway???? Remember the rule for tonight!!! Winner keeps that Golden Finger award for the year, plus all monetary prizes donated by the esteemed citizens of Sarnac, France. Yes, Foch, that's the one. That made the visit most worthwhile for me, it's really beautiful. Thanks for the reminder, David. The golden tones ate just wonderful. Never been in. I am surprised. I'd totally go inside and check out the tomb. I'm all about the guy stuff. Eric, your night shots are always so amazing. Coltrane, Merci! Do you hear that Katie? Katie took that photo of me. She has taken over a 100 photos of me, and I will share them with you. PHX, "...plus all monetary prizes donated by the esteemed citizens of Sarnac, France." WHAT??? You crack me up. Lynn, you sound a little nervous about tonight. You really should make the effort one day. It's beautiful. I look forward to your daily Paris photo every morning that I turn on my computer. Thank you for always showing me such beautiful objects thru your eyes in your photographs! I never want to play Poker with UKLynn or Lois. BTW, what will we ever do if some cockeyed upstart called "anonymous" innocently types in and wins! I'm at the ready, shades on, I've opted for the manicured nails and perfumed hands technique. You? Seriously, I am reading English history (RBT Walpole right now) and can only think about what time it is and getting on the computer. Very nice photo, Eric. I can believe you have never been inside. There must be scores of places in Paris that are interesting, historic, and worthy of visit that you have never made it to. You can do that in a small town as well! Hope you get there someday though.